I was walking around the farmer’s market just sipping in the glory of spring. I love when the market is full of great produce. It’s like a different world compared to the winter months when all I see is apples. I wanted to highlight the bounty of May so I picked up some sunchokes, some healthy ramps, and even splurged on maitake mushrooms ($10 per 1/2 lb). 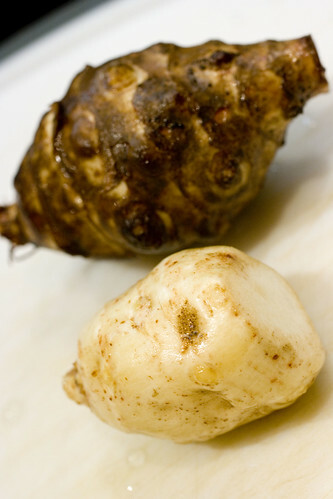 Sunchokes are tubers, a little starchier than jicama, but taste like mellow artichokes, but sweeter. I took this picture because I thought it was amazing how different they look when you scrub them.